It’s my 2nd day on leave from work. I applied for 5 days in total considering I’ll be working very very hard during the Christmas week. So I might as well have my break first before my celebrating colleagues does. I initially planned for a potty training session during the holiday but it’s not going very well as I have chores outside home which needs to get done. This means Hazeeq needs to be in his Drypers as he clings on to me like a shadow as I run my errands. We went grocery shopping today at our new favourite place – GIANT, which we noticed have been relatively cheap to its rival TESCO nowadays. Hazeeq was so well behaved I felt like bringing him to AEON afterwards but our stomaches were already rumbling. But I couldn’t refuse him when we were at the poultry section. 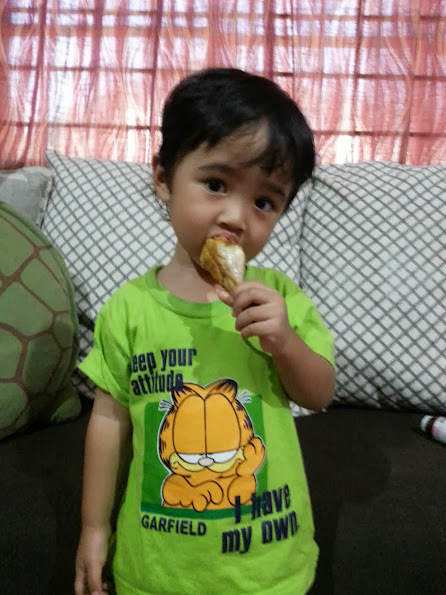 He wanted drumsticks – just like Upin Ipin. Chicken are a good source of protein and helps promote child growth so even if he didn’t ask for it specifically, I would still get it anyway. Then there were fish and chicken wings! Then he asked for grapes and oranges. Good source for Vitamin C – so in the shopping trolley it goes. I added Vitagen and few boxes of Banana Pokka as treats for the boy as well. So for lunch he had one drumstick and another one for dinner. 2 drumsticks in a day! I hope he will be as tall as his father with all this healthy eating. LOL. Grow honey grow!